Found in everything from cough drops to liquor, licorice is not only flavorful, in its natural form it’s packed with nutrients that provide healing and preventative properties. One of the healthiest ways to add a little licorice to any diet is licorice tea, which offers a sweet flavor and full-bodied richness. In fact, licorice is so widely used and safe that is commonly found in everyday products, including medicine. Licorice is perennial legume that grows as a shrub. The root of the plant is harvested for various purposes, most often in tobacco. The leaves of the plant are pinnate, with flowers that range in color from a lovely purple to the palest blue. Licorice is native to Asia and Europe, particularly the southeast. What is Licorice Tea Good For? Licorice is an amazing plant and is also used to treat chronic fatigue syndrome, for weight loss, infections and infertility. However, anyone considering using licorice tea or licorice in large doses should be aware of possible interactions and side effects. What Does Licorice Tea Taste Like? The word licorice hails from a Greek word literally meaning sweet root. True to its origins, licorice has a decidedly sweet flavor, approximately 30 to 50 times sweeter than sugar. Talk about a perfect way to kill a sugar craving in a healthy way! However, the sweet taste of licorice is offset by a tart or tangy undertone that the majority of licorice lovers find irresistible. The aroma of licorice is unmistakable, while the sweet taste lingers long after the tea is consumed. Because licorice is so incredibly unique in regard to taste, it is often favored without any additional herbs or spices. However, licorice blends beautifully with cinnamon, orange peel or orange-based teas, sarsaparilla and star anise. Mint and fennel are also ideal pairings with licorice. Anti-inflammatory properties – Thought to be a powerful anti-inflammatory, licorice contains glycyrrhizix acid, which works much like Motrin or Advil for treating conditions such as sprains and inflammation resulting from infection. The National Center for Biotechnology Information found that ingredients in licorice inhibited the development of histamine, which is related to inflammation. Immunicological activity – Once again, glycyrrhizic acid, one of the most potent properties of licorice, boosts the immune system and supports faster healing, according to Healthline. Antibacterial action – Licorice also contains antibacterial properties, preventing the growth of harmful H. pylori in the gut, reports Healthline. Anti-cancer – A study using Sencar mice that were fed glycyrrhizic acid showed a much longer latent period regarding tumor development when compared to animals that were not given glycyrrhizic acid, reports the National Center for Biotechnology Information. Additionally, WebMD reports that a mixture of licorice root and peony root, vegetable soup with lily bulb, lotus seed, jujube fruit reduces cancer associated pain. Stress reduction – Healthline also reports that licorice reduces stress by actively supporting the adrenal gland. Antioxidant properties – The National Institutes of Health found that licorice in animal studies had potent antioxidant effects, scavenging free radicals. Traditionally, the Egyptians used licorice and over time the plant was used in Traditional Chinese Medicine or TCM for a multitude of conditions. Today, licorice is also available with the active ingredient glycyrrhizen removed, which reduces the health effects associated with licorice. This type of licorice root is referred to as DGL. Only 5 milligrams of DGL should be consumed per day in tea form. The licorice plant features narrow leaves that are long and green, with the root being a tap root, like many legumes. An older licorice plant that is not disturbed produces many flowers, that are a light blue color. Licorice contains calcium, potassium and glycyrhizen acid. Glycyrhizen acid is not unique to the licorice plant, however it is not as commonly found in nature as many other substances. Are There Any Side Effects From Licorice Tea? Licorice when consumed in food amounts is safe for most people, however using licorice in medicinal amounts, high doses or for extended periods should be done with extreme caution or under the care of a licensed herbalist. Some potential side effects of licorice include high blood pressure, headache, a decrease in libido for men, water retention and sodium retention. Side effects associated with use of four weeks or longer and large doses include paralysis, weakness, low potassium and brain damage. Pregnancy and breast-feeding do not mix with licorice or licorice tea. It is possible for miscarriage or early delivery to occur, and there is not enough reliable information to suggest whether licorice is potentially harmful to breast-feeding infants. Additionally, people with high blood pressure, heart disease, hormone sensitive conditions like breast cancer, hypokalemia (low potassium), hypertonia and erectile dysfunction should avoid licorice, as it can make these issues worse. Anyone scheduled for surgery should stop using licorice tea at least two weeks before surgery, as licorice can cause complications with blood pressure control during surgery. Licorice does interact with some medications, most notably warfarin, increasing the risk of clotting. Moderate interactions include licorice and digoxin, estrogens, Edecrin and medications changed by the liver. Some of these medications include Celebrex, Voltaren, Glucotrol, Advil or Motrin, Dilantin and Feldene. Corticosteroids, diuretics and high blood pressure medications also interact negatively with licorice. This list is not conclusive and those taking medications should always check for possible licorice interactions before consuming this tea. Typical dosage for licorice tea or a licorice root infusion that is considered safe is 0.2 milligrams per day. However, licorice for conditions such as gastritis and ulcers can be as high as 2 to 15 grams per day. Again, this high dosage level poses potential health risks. Making licorice tea is very simple. Use approximately 1/2 to 1 teaspoon of root chips per cup of boiling water. Typically 1 teaspoon is used per 4 ounces of water. Allow the mixture to steep for 5 minutes after removing from heat. Strain the root and enjoy. Licorice tea can be found in virtually any health food or organic store. Yogi Tea makes a very popular Egyptian licorice tea, while other recommended brands include Alvita and Tea Spot. For those who prefer a blend, Hampstead Tea offers a wonderful fennel licorice blend and Yogi Tea has a licorice mint that’s delicious. Who Can Benefit From Licorice Herbal Tea? Many people can benefit from licorice tea and licorice tea blends. Many weight loss teas, cough and cold teas, and cleanse or detox teas contain licorice root. Those with arthritis, the common cold, heartburn, canker sores, dental plaque, hepatitis, high cholesterol and recurrent fevers should consider using licorice tea, which is an effective remedy for these conditions. 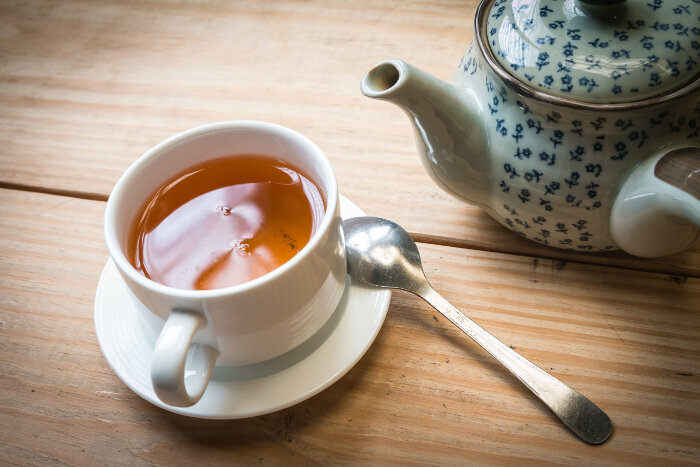 Individuals who are not ill or suffering from a medical issue can also benefit from the antioxidant and potential anti-cancer properties of the tea. Licorice tea offers many truly amazing health benefits, yet at the same time can be dangerous for some people. The flavor of licorice tea can be something of an acquired taste, seemingly inspiring a love or hate relationship in tea lovers. While the DGL option allows more people to safely consume licorice tea, most health benefits associated with the tea are a result of glycyrrhizen. However, for those who simply enjoy the taste of licorice, cannot use traditional licorice root and do not have a medical issue, DGL is a smart choice. Black licorice is used to flavor candy, liqueurs such as Jagermeister and the ever tasty cold and flu medication NyQuil. In Europe, it was believed that a single piece of licorice could keep a person alive for almost two weeks.